Our teachers arrange the environment and implement activities which center around a child-directed, hands on approach to learning with free exploration and open discussion. We implement the "theme" approach in our teaching, in which teachers select a specific topic of study and integrate it into the various areas of the classroom. The curriculum is designed to meet the individual needs of each child's development and are based on teacher observations of the class. Each week teachers determine if changes to the environment are needed based on their observations of the children's play. Throughout the day, children are given the choice to participate in art, science, blocks, puzzles, dramatic play, literature, music, sensory, and large and small motor activities. 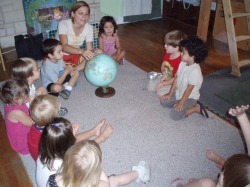 There is a teacher directed time each morning and afternoon, which we call circle time, where the children sit together as a group and sing songs, play counting and letter games, read stories and/or have a special lesson based activity . Children also play outdoors in our large tree-shaded playground several times a day. Play activities on our playground include a natural, cedar playscape, sand and gravel box with various digging implements, ride toys, dramatic play accessories, climber, balance beam, sensory activities, balls and playhouse. In the summer we have Splash Days with a sprinkler on the playground twice a week. We also offer optional Spanish classes through Mariposas Spanish School which meet once a week on Friday mornings. Please visit their website at http://www.mariposasspanish.com for more information about their program. All children bring their own lunches, and we provide morning and afternoon snacks each day. Children must be 2 by September 1st to enroll in this classroom. Children must be 3 by September 1st to enroll in this classroom.